As wooden chess manufacturer, we always try to create something new and unique. Here we create and designed it by using our imagination to produce something different and unusual product. So that, we introduce you a decorative chess in relity kingdom. 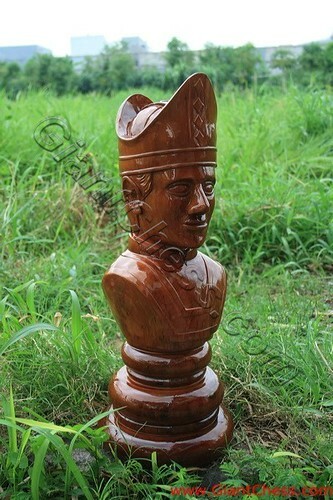 Still using wood material and carved by our expert craftsman, we give you an example of decorative chess piece. As an example, this King piece has a realistic shape of virtue. This chess is crafted in three dimensional shape and adopted realism style. Beside that, you can use this kind of chess as your house decoration. Reality kingdom chess is a best collection and decoration for your space. So that you can decorate your house and room with our unique product. Not only for indoor area, you can also use it for outdoor decoration. Don't worry about its durability, because our product has made from best Teak wood material. So its very durable for any seasons.